Online there are many documents about GROMACS and Carbon Nanotube (CNTs) (1, 2, 3, ...). Even after lots of reading I didn't find what I was looking for: a clear and simple guide to model single- or multi-wall carbon nanotubes (SWNT, MWNT), either periodic and non-periodic. 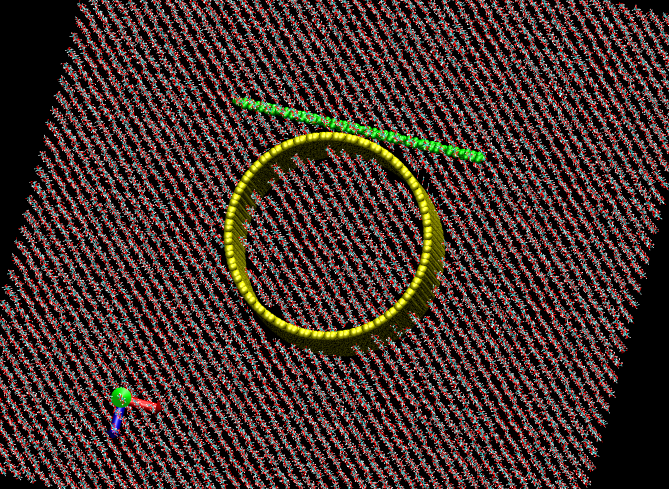 It taken me a while to find a procedure that does the things as I wanted: build a periodic CNT and create the topology for GROMACS. The first step, obviously, consists in building the Carbon Nanotube, for example with YASC buildCstruct. With this script it is possible to build singlewall and multiwalls CNT, both armchair or zigzag, finite or periodic. The output file is a TINKER xyz file that can be edited to XYZ and then converted in pdb, for example using the ChemAxon Marvin Beans utility molconvert or openbabel or saved directly in pdb using vmd. Since version 1.1, buildCstruct is able to save the structure directly in gromacs GRO format. The gro file will then contain the CNT centered in the periodic box that has been specified. Note that if you use YASC buildCstruct to build the nanotube, it will be periodic along the b vector (Y-axis). 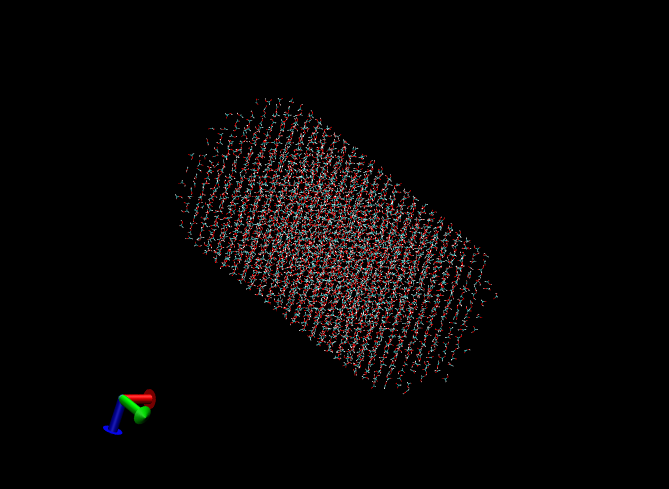 Be careful to have a unit cell big enough to contain all the CNT, or you won't be able to generate the topology. You can check this with gromacs ngmx or molden or using pbc in vmd. Also, mind to choose a box bigger enough to contain also the other molecules you may want to put in contact with the CNT, e.g. polymer chains. x2top requires a bunch of files in order to properly create the topology file. I wanted to use the oplsaa force field, but I didn't want to mess up the original ffoplsaa files in the share/gromacs/top directory, therefore I have created from scratch the files I needed. This file is used to translate name in topology. It reads the name of an atom in your structure and, based on its connectivity (i.e., the number of bonds, the bond lengths and the atoms bonded), tries to guess the proper atom type among those defining in the .n2t file. CJ    HJ      1    0.10800   307105.6   ; PHE, etc. No dihedrals are used at the moment. 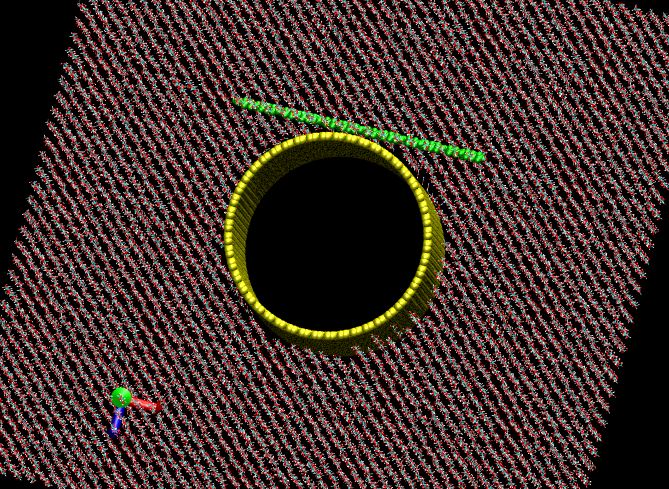 ; New format introduced in Gromacs 3.1.4.
; Dont use this forcefield with earlier versions. ; you should use PME. ; Col 5: Generate all dihedrals if 1, only heavy atoms of 0. The option -pbc will generate all bonds, angles and dihedral that cross the periodic boundary conditions (this is why in the .gro file we need to specify the good size of the cell). If your nanotube is not periodic, then no need to go for -pbc. The last step consists in change from 1 to 3 the function used to describe the dihedrals. That's all… now you are ready to model your periodic CNT or carbon-based structure. 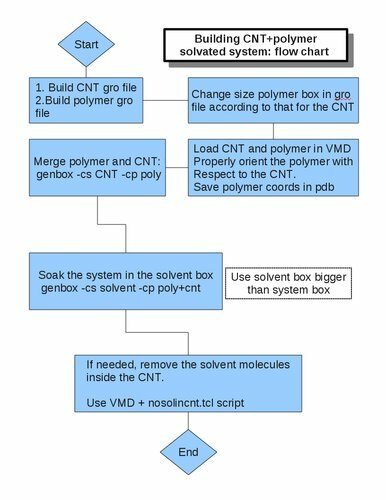 To solvate a CNT we can use the gromacs utility genbox with the options -cp (the nanotube gro file) and -cs (solvent box gro file). Usually, I previously equilibrate a solvent box in NPT and then create a supercell in order to have a box bigger than the cell of the CNT. This because the box of the solute (-cp) will be the box of the final system. 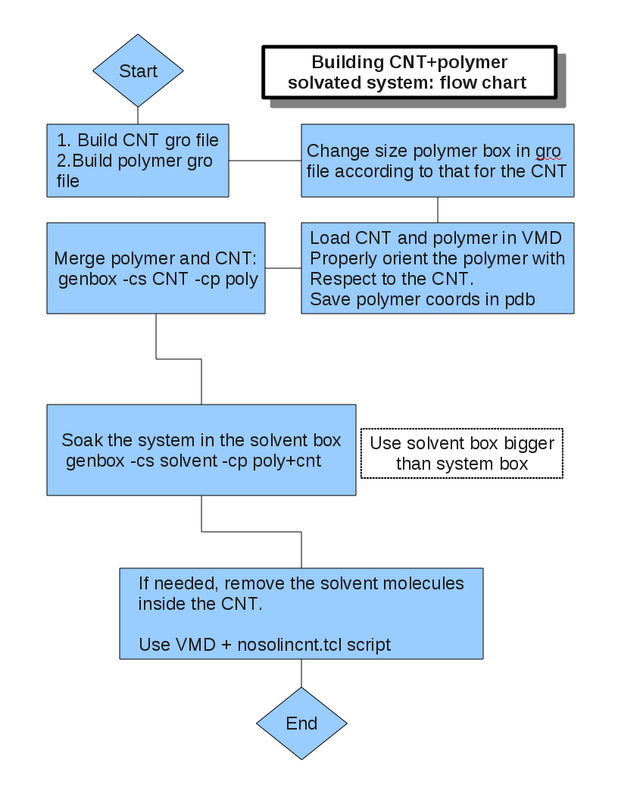 The index file to use with editconf in order to remove the molecules of solvent from inside the CNT, can be easily written by YASC nosolincnt, a tcl script for VMD. You will be prompted to insert the fragment number of the CNT (play with the representations if you are not sure about this) and the CNT radius in Angstrom. Those info are used to create a cylindrical selection of the given radius taken from the X-,Z-coords of the CNT center of mass. You can check the result of this selection by pressing C when the view window is active. If everything is good, then press W and the index file, without the selected atoms, will be written. In the photo gallery below, a solvated CNT with solvent molecules included in it, the molecules to remove and the final system are displayed, respectively. A video tutorial to illustrate the procedure is here. I don't really know what interest could have model a solvated CNT alone, surely, if we add a polymer to the game, things will get more interesting. Below the flowchart I have found to solvate a CNT interacting with a polymer chain. I solved the problem by adding a residue name to the .gro and .top files. Can you please answer this question. How Gromacs differentiate same atom pairs and bond length having different charges from info in Pdb files? For example? For example OH of carboxyl group and Phenolic OH group has same atoms and bond length but slightly different charges.